BDSwiss (formerly known as Banc de Swiss) is a registered trade mark of BDSwiss Holding Plc., a Cyprus Investment Firm authorized and regulated by the Cyprus Securities and Exchange Commission (CySEC) under license # 199/13. Its trading platform is provided by SpotOption, one of the biggest in the trade, and was founded in 2011 in Germany, the broker also comes from a serious background. BDSwiss emphasizes the envelope it providers clients with, including market news, an economic calendar, trader education, a lounge for interacting with fellow traders, rewards and prizes and 24/7 support. People with no experience in binary options will certainly get the feeling of safety and security, or at least more so than from other brokers. 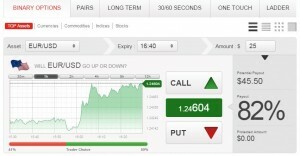 There are many features available on the website that add to the binary options trading experience. The education center contains an extensive list of videos that will bring new traders up to speed. The market news section is well designed and up to date. There is also a blog with articles covering market events and facts. Examining the trading section, we can see what the trading framework looks like. Here again, it is clear, uncomplicated and easy to use. Parameter selection for placing orders flows naturally from left to right and then down. All relevant information also follows the same route. Much like in other platforms, the trader sentiment which appears below the chart is of little use. Perhaps the platform providers should try and improve the chart performance instead. Taking a look at the asset list we can see what BDSwiss has to offer: FX majors, many FX crosses, core commodities, several leading world indices and a number of stocks. In terms of asset list diversity, the broker ranks somewhere in the middle. Option types available for trading are digital, turbo, pairs, one touch and ladder. Long-term options are also available. Digital options expire every 10 minutes and also at the end of the day. The pairs options allow for speculating on which of the 2 assets will perform better and expire every hour or also at the end of the day. Turbo options are available for 30, 60, 120, 180 and 300 seconds. One touch options are weekly, but they have a significantly higher payout. Payouts vary widely and in some cases are as low as 54% as for the 30 second turbo USD/CAD option. The one touch Google weekly option, however, has a payout of 550%. In general, the payouts are the usual – between 70% and 80% and depend on asset liquidity. For example, the EUR/USD digital option has a very nice payout of 82%, higher than most of the competitors. In conclusion, BDSwiss seems to be a modern binary options portal focusing on education and information about the market as much as trading it. The company does have its own take on how to do that, but option types and option availability differ from other established binary option brokers.